Yesterdays success with the flow meters meant we could now turn our attention to deploying the new drip sensors. 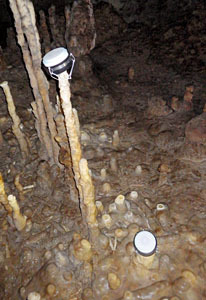 Trish had ongoing work in the Rio Secreto Nature Reserve section of Pol Tunich cave, included an interesting student project monitoring calcite raft deposition. A maintenance visit to those experiments was already on the schedule, so it was an obvious choice to use that site for our first drip sensor deployment as well. Even better, Rio Secreto had several capable science liaison staff, some of whom were conducting experiments of their own nearby. 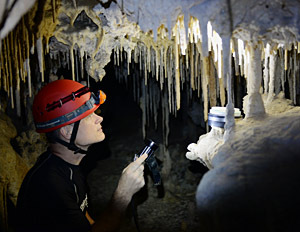 When you do something for the first time in the field, you tend to improvise allot, especially when you are trying to apply the Goldilocks principle to something as random as cave drips. But Trish seemed to know exactly what she was after, and with the help of our guide from Rio Secreto, we quickly started locating ‘gotas’ that were ‘just right’. We knew from Kayleen’s video that the water level in the cave could be highly variable so we tethered the units located close to the water level to assure that flood conditions would not wash them away. They are intentionally placed at an angle, so that water does not pool on the sensor surface and cause spurious readings. We also wanted to set the sensors in areas with multiple drips in relatively close proximity. Trish has always been fascinated by the question of why some drips readily form deposits while others quite nearby, possibly with similar chemistry, are much less capable of creating decorations. With this in mind our guide led us to a wonderful “stalagmite garden” which had many excellent drip sites for comparison. 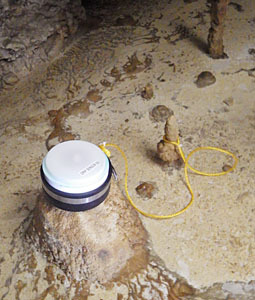 We found that the soft, slightly concave rubber bottom on the drip sensor housing made it very easy to perch the sensors without harm to the stalagmites. Several units were set up in short order, and as we exited the cave we could see their little green indicator lights blinking away in the darkness behind us. Even with the help of lithium AA batteries, there is a fair bit of uncertainty about how long these units will actually run, so I was quite happy to hear our guide Fernanda say that she would stop in to check on them when she had the chance. The sensors are designed to light a red led when the battery voltage falls too low, but I told her to remove and disconnect them before that if they showed any other unusual behavior. These units were assembled with an assortment of cheap clone boards, most of which use the MIC5205 voltage regulator, and I will be especially keen to see the performance of the one build with the Rocketsream Ultra, as it’s MCP1700 delivered some very low sleep currents during my bench top testing. My hope is that we get at least four months of good data from all of them before the batteries expire. This first deployment was a great success, which you can read about here. This entry was posted in Developing a DRIP ⚶ sensor, Expedition Reports & Updates on September 19, 2014 by edmallon.